What are the advantages of being a female anthropologist in the field? According both male and female anthropologists, there are both advantages and disadvantages of being either gender. The following is an essay about some of the issues of being a female or male anthropologist studying gender roles in the field (Part I), and the feminist dilemmas in fieldwork (Part II). 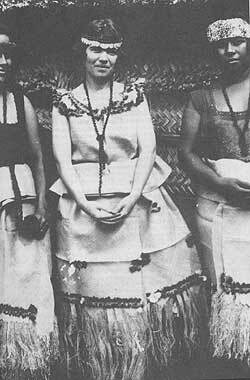 According Margaret Mead she didn’t experience any drawbacks for being female because she was studying her same gender: adolescent girls in the traditionally gender-segregated culture of Samoa. Because she was both a cultural outsider and presumed to be of very high status by the Samoans, her access to her informants were assured through her gender and association with the local admiral (Mead 1993:79). Hortense Powdermaker, an early feminist anthropologist with Mead, notes that the only drawbacks she experienced being a female during her fieldwork on the island of Lesu in the south Pacific, was her lack of access to the “casual social life” of men (Hortense 1993:85). However, even though the “sexes were quite separated” on the island, and she didn’t go to the men’s activities unless she was invited, she was “invited to everything” by her male informants (Hortense 1993:85). According to David Gilmore, the disadvantage of being a male anthropologist studying power in domestic relationships between male and female farm workers in southern Spain was the lack of access to women informants in the machismo culture. Gilmore notes his experiences as a male anthropologist working in a tradition-bound culture where the genders are almost totally segregated in “Men and Women in Southern Spain: ‘Domestic Power’ Revisited” (Gilmore 1993:185). He studied the political relationships between men and women farm workers to see which gender held more “domestic power” in two small rural towns in southwestern Spain (Gilmore 1993:186). He felt it was the biases of previous male anthropologists that discounted the superior power women held in their domestic relationships. Gilmore claims that the gender-segregated culture he studied in southern Spain was “equally repressive for both sexes” (Gilmore 1993:187). A “good man” is not expected to be involved in domestic activities such as wedding planning and household concerns which are considered the domain of “good women” (Gilmore 1993:187). A man is “expected to remain outside of the home” or his masculinity is questioned (Gilmore 1993:187). Gilmore noted that men are expected to be either at work or at the neighborhood tavern– even if he is unemployed. Mari Womack and Joan Barker noted both the disadvantages and advantages of being female researchers studying male-dominated sub-cultures in “Adventures in the Field and in the Locker Room” (Womack 1993:99). Womack studied the sport rituals of professional hockey players and spent much of her time doing research in traditional all-male arenas such as their game rinks and locker rooms. Barker studied the culture of the Los Angeles Police Department. The sole disadvantage they reported of being female was the tendency of women for becoming a scapegoat when things go wrong. Both believe that because their gender, they were permanent outsiders to male groups and “viewed as polluting by many groups, including professional sports teams” (Womack 1993:111). Womack notes that the customary barring of women from male rituals of solidarity. This is because the “female-male pair bonding threatens the male-male group bond” (Womack 1993:111). From my own experiences as a minority female in male-dominated sports, I haven’t experienced the “women ‘viewed as polluting” phenomenon mentioned by Womack. However, it may well apply in other cultures where there is more emphasis on symbolic purity and pollution. After doing an informal poll about the “polluting” theory with a few men (n=3) who played team sports such as hockey, football and soccer, they agreed. The “pollution,” they felt was not due to Womack’s gender, but was due to her “outsider” status in general. A male outsider would be construed just as threatening to the team’s solidarity and esprit de corps–especially in situations where there are high stakes and a real risk of failure. David Siemens focused on the “women’s viewpoint” when he conducted fieldwork for 19 months in Southern Sudan, about five miles from Evans-Pritchard’s field site (Siemens 1993:91). From his experiences, he found out that it was his assumptions about being a male studying women, and his informants’ assumptions about his gender that initially inhibited his “gaining access to “women’s (and men’s) knowledge” (Siemens 1993:92). “As a white male educated outsider, I was given the treatment accorded to high status males” (Siemens 1993:92). Descendents of the informants of Evans-Pritchard associated him with Evans-Pritchard who gave them elaborate feasts like a chief and separated him as was their custom from low-status individuals and women. However, unlike Evans-Pritchard who “spoke mainly to men and found no reason to spend time with women,” Siemens contested the local custom to separate him from women and was able to conduct his research of womens’ roles in Azande society freely. “Zande men and women have authority over different aspects of social life. Men are concerned with political offices, litigation and oracular procedures. Women are concerned with birth, bringing children into society, and mourning,” Siemens says (Siemens 1993:92). From Zande women he learned about “rites of passage” for babies and it became the focus of his research. Siemens said it was his high social status and not his gender that ultimately inhibited his access to low status males and females at the field site. In Zande culture high-status individuals were usually isolated from low-status individuals. Once the status issue was sorted out with the help of his wife, his high status actually aided his access to women’s knowledge as his female informants vied to be included in his kinship surveys and other research. Annette Weiner analyzed the different ways social structure was reproduced on the Trobriand island of Kiriwina during her fieldwork there in the early 1970s. Weiner lived in her informants’ village of Kwaibwaga and participated in many of their activities, like Malinowski and the previous ethnologists who studied the Trobriander society. However, unlike her predecessors, Weiner “saw Kiriwina women as active participants in the exchange system” and she accorded them an equal place in society beside Kirwina men (Weiner 1976:11). And, as a female, Weiner had greater access to the women’s work and the production of village and had greater opportunities to understand its processes and symbolic meanings by being able to participate in women-only rituals and craft-production. Both Womack and Barker report that being female gave them advantages as cultural outsiders who were not obligated to abide by each groups’ norms of behavior and membership when researching their male-dominated groups. 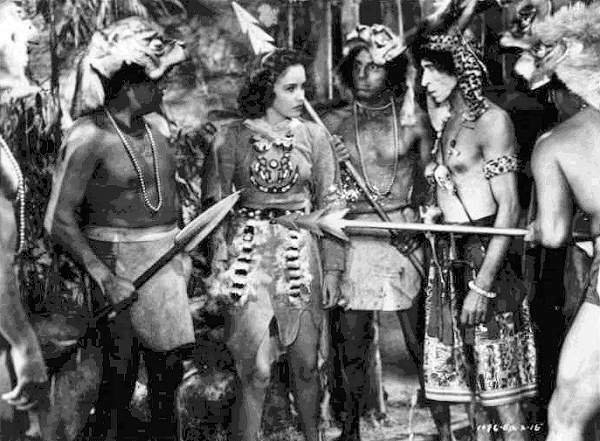 As female cultural outsiders, they were less threatening to the solidarity of each group than male cultural outsiders since they could never be insiders due to their gender. “As Mary Douglas (1966) has noted, it is ambiguity and mixing of cultural categories that is particularly threatening (Womack 1993:104). Another advantage of being a female studying a male-dominated group was that as females, they were perceived to be empathetic listeners. The “empathy factor” was a big advantage (Womack 1993:107). Finally, as women anthropologists, the men considered their interest as “flattering” and it gave them a chance for male display (Womack 1993:107). “Males who are part of a machismo culture often seem to view it as incumbent upon them to please a woman by giving her what she wants or what they think she wants. Therefore, they feel an obligation to answer questions posed by woman in a one-on-one context,”they say (Womack 1993:110). However, they warn that their gender advantage is lost if there are other males around. According to David Gilmore, the advantages that male anthropologists bring to the study of a culture would be their inclusion in male-dominated group activities and casual life in a gender-segregated culture where “men ‘belong’ in the streets, women in the home” (Gilmore 1993:185). Feminist anthropologists study gender differences, female subordination and feminine roles of childcare, reproductive rights, female sexuality, control of resources and social inquality (Bratton 1998) They did this by including the female perspective and through their representations of women as significant actors in their socieites. However, feminism has historically been a movement to change culture by advocating for less female repression. Anthropology, on the other hand, is a social science has historically been to study and even salvage endangered traditional cultures. Both disciplines have been representative of the hegemonic values of its founders: middle class and white. As such, there have been ideological dilemmas for self-described feminist anthrologists when studying non-middle class and non-white cultures. These feminist dilemmas are described in Part II of this post. Abu-Lughod, Lila 1991 Writing Against Culture In Recapturing Anthropology: Working in the Present. RichardFox, ed. Santa Fe, NM: School of American Research Press, Pp.137-161. Castañeda, Xochitl and Patricia Zavella 2003 Changing Constructions of Sexuality and Risk: Migrant Mexican Women Farmworkers in California. The Journal of Latin American Anthropology 8(2):126-151. Editor 2012 Faculty Bio: Lila Abu-Lughod. Department of Anthropology, Columbia University. Electronic document: http://www.columbia.edu/cu/anthropology/fac-bios/abu-lughod/faculty.html accessed February 27, 2012. Gilmore, David D. 1993 Men and Women in Southern Spain: “Domestic Power” Revisted. In The Other Fifty Percent: Multicultural Perspectives on Gender Relations. Mari Womack and Judith Marti, eds. Pp. 185-200. Long Grove, IL: Waveland Press, Inc.
Gordon, Robert, Andrew P. Lyons, and Harriet D. Lyons 2011 Fifty Key Anthropologists Routledge Taylor & Francis Group. Mead, Margaret 1993 Samoa: The Adolescent Girl. In The Other Fifty Percent: Multicultural Perspectives on Gender Relations. Mari Womack and Judith Marti, eds. Pp. 69-83. Long Grove, IL: Waveland Press, Inc.
Powerdermaker, Hortense 1993 A Woman Alone the Field. In The Other Fifty Percent: Multicultural Perspectives on Gender Relations. Mari Womack and Judith Marti, eds. Pp. 84-90. Long Grove, IL: Waveland Press, Inc.
Siemans, Stephen David 1993 Access to Women’s Knowledge: The Azande Experience. In The Other Fifty Percent: Multicultural Perspectives on Gender Relations. Mari Womack and Judith Marti, eds. Pp.91-111. Long Grove, IL: Waveland Press, Inc.
Weiner, Annette B. 1976 Women of Value, Men of Renown. Austin, Texas: University of Texas Press. Wolf, Diane L., ed. 1996 Feminist Dilemmas in Fieldwork. Boulder, CO: Westview Press. Womack, Mari and Joan C. Barker 1993 Adventures in the Field and in the Locker Room. In The Other Fifty Percent: Multicultural Perspectives on Gender Relations. Mari Womack and Judith Marti, eds. Pp. 69-83. Long Grove, IL: Waveland Press, Inc.
2012 Comprehensive Exam Question: What drawbacks based on gender can males and female anthropologists face in the field? And, what advantages or strengths does each bring to the study of a culture? Draw on the writings of Mead, Powdermaker, Gilmore, etc. What are perceived as feminist dilemmas in fieldwork? Draw on the writings of Mead, Siemans, Zavella, Wolf. This entry was posted in Cultural Anthropology, Feminism & Gender Studies, Fieldwork by arkirwin. Bookmark the permalink.